Nike is promoting the T90 Laser III football boots in “Hit The Target”, an online advertising campaign going live on television during the Carling Cup semifinal between Manchester UNited and Manchester City. The Premier League’s top scorer Wayne Rooney, wearing the brightly coloured green and ref boots, takes on the challenges of optical illusions produced by laser rays. Liverpool’s Fernando Torres, has the controls. 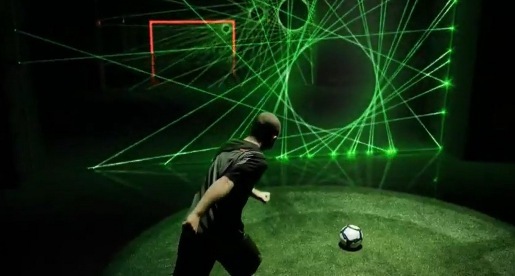 The T90 Laser III Accuracy challenge in NikeTown London, developed by AKQA and TRO, provides fans and shoppers a chance to trial the boots and pit themselves against goalmouth lasers, recreating Wayne’s role in the film. The highest scorer will go through to the Sunday’s final and take on a top Premier League player for the crown. The Hit The Target campaign was developed at Wieden+Kennedy London by creatives Phil Monkns and Mike Cuthell, and agency producer James Guy. Filming was shot by director Anthony Dickenson via Pulse Films, London, with producer Mark Harbour. Editor was Paul Hardcastle at Trim Editing, London. Post production was done at Time Based Arts, London, by Lead Flame Mike Skrgatic, Assist Flame Sheldon Gardner/ Pheng/ James Allen, 3D artist Jess Gorick at Graphic Onions, colourist Ben Rogers at Glassworks and sound designer Will Cohen. Music is “Jump”, by 16bit.